For satay dip: Cook the olive oil, sesame oil, red onion, garlic, ginger root, and red pepper flakes in a small, heavy-bottomed pot on medium heat until the onion is transparent, 10 to 15 minutes. Whisk in the vinegar, brown sugar, soy sauce, peanut butter, ketchup, sherry, and lime juice; cook for 1 more minute. Remove from the heat, and allow to cool. Place dip into a small bowl and use an immersion blender to reach desired consistency (can also be placed in a blender, but will be more difficult to clean I imagine); chill until ready to use (yields 1 ½ cups). For chicken skewers: Whisk together the lemon juice, olive oil, salt, pepper, and thyme. Pour over the chicken breasts in a non-reactive bowl. Cover and marinate in the refrigerator for no more than 4 hours. Preheat the broiler; thread 3 to 4 pieces onto bamboo skewers (that have been soaked in water for at least 30 minutes), and arrange onto 2 sheets lined with aluminum foil. Broil the skewers (one pan at a time) about 6 inches from the heat for 10 to 15 minutes (or until cooked through); repeat with second pan of skewers. 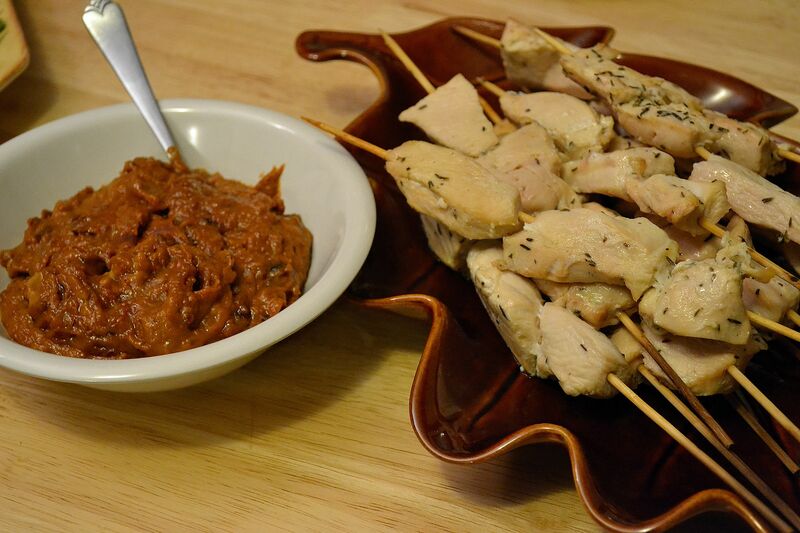 Serve immediately with Satay Dip. Read more about this appetizer and my musical pairing by clicking HERE.